I've been a Steve Garvey fan since the early 80s and made him the subject of my first player collection many years ago. Decades later, check out how obscure my "active career" wantlist looks. At this point, I'm lucky to follow more advanced collectors in their pursuit of things like his Gafline Microfiche "card," and Long Beach Telegram cutouts, never mind spending my modest collecting budget on real ones. Given that rare shot at vintage hits, I've been happy to expand into modern retro Garveys and who else but GCRL sent a six-pack that arrived yesterday. Check out the shiny! 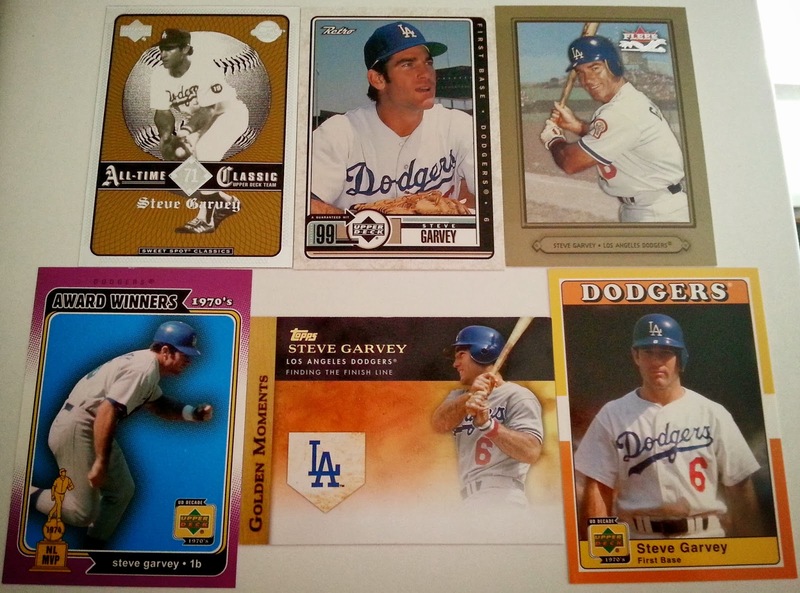 It's hard to pick one favorite, but I'll go with 2002 Fleer's gold-bordered photo of a classic Garvey batting pose (upper right). The back recalls his 1981 World Series hitting in LA's win over NY. 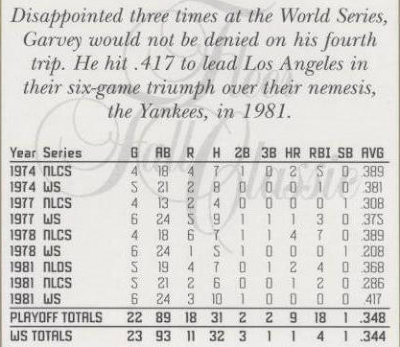 That 10-for-24 World Series hitting line didn't knock anyone in, but not because Tom Lasorda used Garvey any differently, it was because the 1-2 batters rarely got on base in front of him. 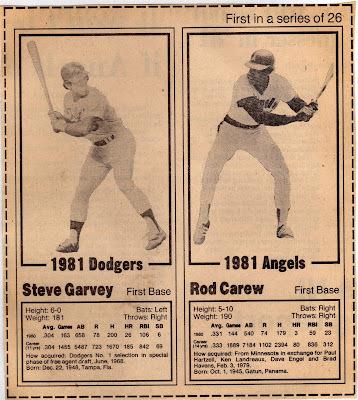 Ultimately, Ron Cey, Pedro Guerrero, and other late-order guys contributed enough big hits that LA came back with 4 straight wins after starting 0-2. 1981 also marked my first televised World Series, having been radio-only (and too young to pick a favorite) for the 1979 and 1980 Pennsylvanian championships. I'm sure LA's exciting win had more than a little to do with Garvey (who shared my Little League position at first) becoming a favorite. Thanks again, GCRL, and go Dodgers!